I put together a list of what I feel are some of the top highlights from this year’s survey, with a brief explanation of what they mean for local business owners. Mobile usage continues to grow. Although desktops are still the most popular way to read online reviews, more than half of the consumers surveyed said that they typically use more than one device to research local businesses. 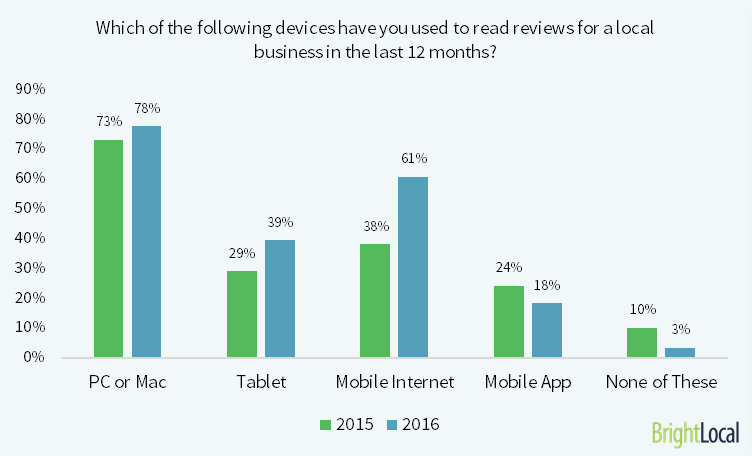 In 2016 the percentage of consumers using mobile devices to read online reviews increased by 60 percent since last year – from 38 percent to 61 percent. Consumers tend to be superficial when looking at online reviews. One of the new questions that was added to this year’s survey asked consumers which factors they pay most attention to when evaluating online reviews. Surprisingly, a business’s average star rating was the most significant factor, followed by sentiment and recency of reviews. What’s even more puzzling is that less than a third of respondents are even bothering to the read the actual reviews. Since this is the first year this question was asked, there unfortunately isn’t any previous data to compare these findings to. I’d imagine that over time, consumers will become more scrupulous when reading online reviews. Word of mouth still reigns supreme, but social is closing the gap. 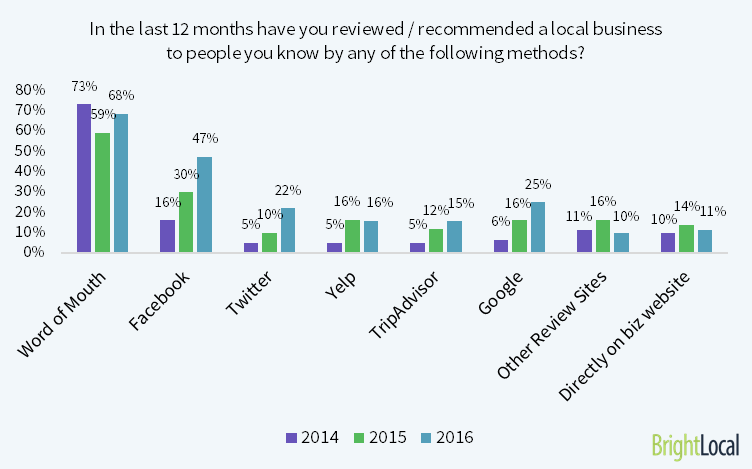 Although word of mouth is still the most popular endorsement for local businesses, reviews on social media sites like Facebook and Twitter have increased significantly since 2014. Additionally, one in four consumers said that they reviewed a business on Google in the past 12 months, which is nearly a 10 percent increase since 2015. Interestingly enough, Yelp seems to have plateaued. Most consumers will leave a review if you ask. 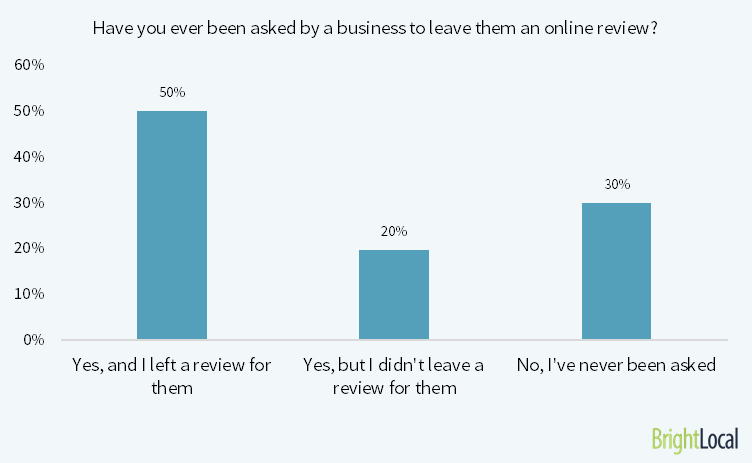 Half of the consumers surveyed said that they left a review after a company asked them to. However, that number is actually skewed since 30 percent of the respondents said that a company has never solicited a review. When you eliminate those that were never asked, that number increases to 70 percent, meaning 7 out of 10 consumers will leave a review if you ask them to do so. It’s as simple as that, folks! All you need to do is ask. Most consumers trust online reviews as much as personal recommendations. 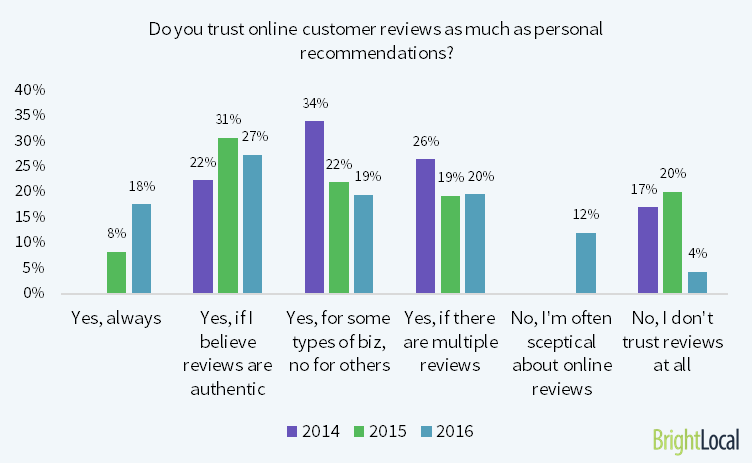 The percentage of consumers that always trusts online reviews as much as personal recommendations increased by 125 percent over the past year – from 8 percent to 18 percent. It’s also worth noting that 84 percent of consumers said that they trust online reviews as much as personal recommendations under certain circumstances, such as the type of business, the total number of reviews, if they believe the reviews are authentic. That means that only 16 percent of consumers don’t trust online reviews –down from 20 percent last year. 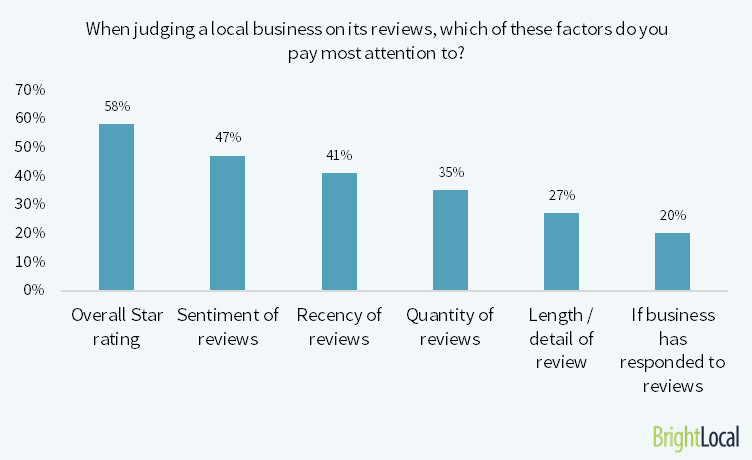 Online reviews are extremely important for local businesses. Not only are customers writing online reviews more frequently, but they also trust them more to help guide their purchase decisions. When you look at the trends from 2010-2016, it’s clear that the value of online reviews – for both consumers and local business alike – will only continue to grow over time. In addition to getting more positive reviews, businesses need to do everything in their power to minimize negative reviews, in order to protect their online reputation. For businesses facing a large number of negative reviews, we can help you push down negative search results on Google, and develop strategies to help you generate more positive feedback. Contact our reputation management team today for more information!